Brave beyond belief. 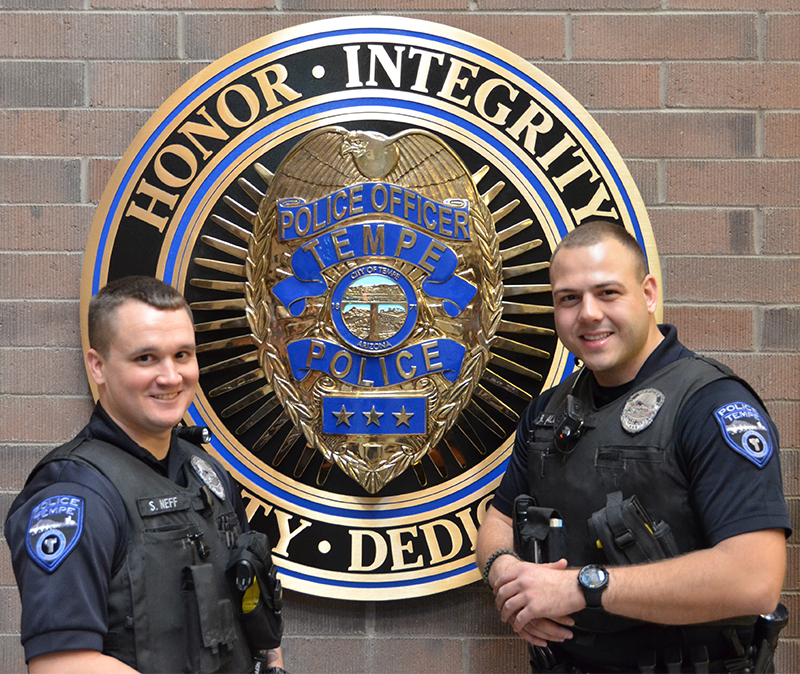 Reno Officers Officer Stephen Neff (left) and Ratko Aleksis. 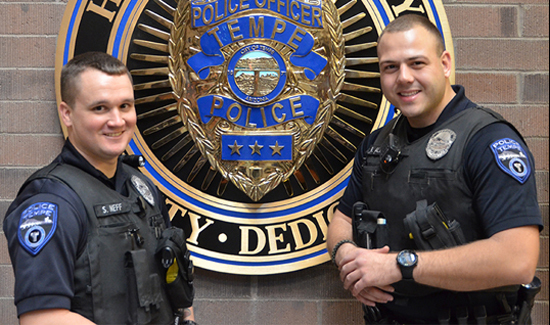 Heroics land Tempe officers coveted NLEOMF “Officer of the Month” Award. On evening of November 17, 2013, Officers Stephen Neff and Ratko Aleksis responded to a call of shots fired in Tempe, Arizona, a Phoenix suburb. As the first officers to arrive on scene, they immediately directed bystanders to safe locations and then set out to pinpoint the exact site of the shooting and the location of victims. One bystander informed the officers that the shooting had taken place in the street and the victim was inside one of the nearby residences and appeared to be bleeding profusely. Not knowing the shooter’s location, Aleksis and Neff used extreme caution as they entered the home indicated. They began clearing the residence until they reached the victim who was bleeding heavily from a gunshot wound to the thigh. The victim had attempted to use his belt as a tourniquet, but Stephen Neff found it was insufficient to stop the bleeding. He removed the belt and began to treat the victim for shock. Meanwhile, Officer Aleksis used trauma bandages he carried to apply a tourniquet in an attempt to ease the victim’s blood loss and kept paramedics, stationed outside the residence, updated by radio. Concerned the shooter might be hiding in the residence, he kept his firearm pointed into the house as Neff kept attending to the victim. When additional officers arrived on the scene, Aleksis helped clear the remainder of the house to ensure the suspect was not present. Approximately 10 minutes passed from the time the victim was found until the house was clear and paramedics could enter the home. Later that evening, a police helicopter spotted the suspect hiding in a nearby backyard, where he was subsequently arrested. It was discovered that the gunshot victim had attempted to intervene in a domestic dispute and was subsequently charged by the suspect who fired a single shot into the victim’s leg. Ratko Aleksis, a former licensed practical nurse, and Stephen Neff, a former Army Ranger, both carry trauma kits on the job. That was the essential equipment that enabled the officer to provide emergency medical support and stabilization of the victim’s arterial bleeding. Both officers had less than 18 months experience at the Tempe Police Department at the time of this incident and were assigned to separate patrol squads. Tempe Deputy Fire Chief Gary S. Ells said his agency was convinced that the actions taken by Officer Aleksis and Officer Neff were instrumental in reducing the victim’s blood loss and keeping him alive until paramedics could render advanced life support and transport the victim to the nearest trauma center. For more information about the National Law Enforcement Officers Memorial Fund’s Officer of the Month Award, visit www.LawMemorial.org/OTM.